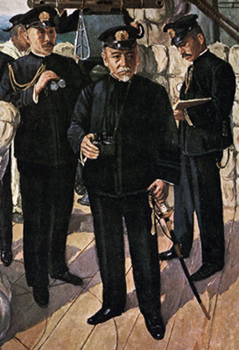 東郷海軍大将と長剣「吉房」Admiral Togo's navy saber "Yoshifusa"
Admiral Tōgō's naval saber "Yoshifusa"
Commander in Chief Tōgō who grasps a saber Yoshifusa to the left hand at the naval battle of the Sea of Japan. The portion of "the figure of the Mikasa enclosed bridge." 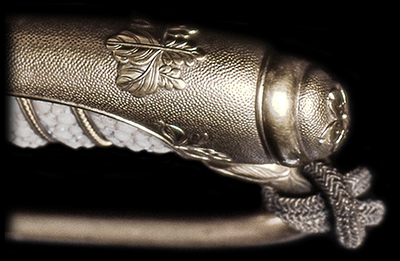 This is a saber mounting (one hand grip) of the 1896 establishment. 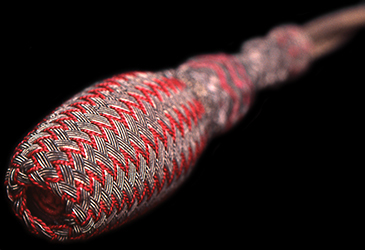 However, in order to dedicate the Japanese sword "Yoshifusa" in 1904, it became a hilt of the both-hands grip. A backstrap and guard: Convex engraving of "Paulownia of 5-7." 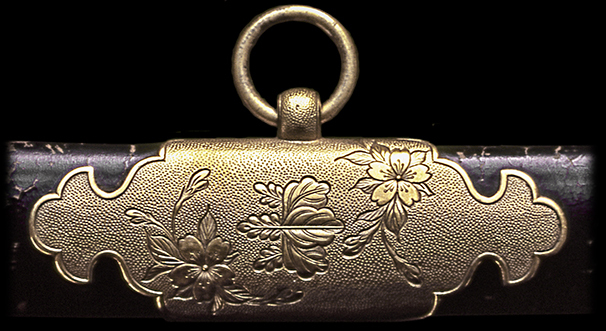 Backend of a hilt: Convex engraving of "cherry blossoms." Each metal parts: Line engraving of "Paulownia of 5-7" and "cherry blossoms, a bud, and a leaf." a fringe is a gourd type. 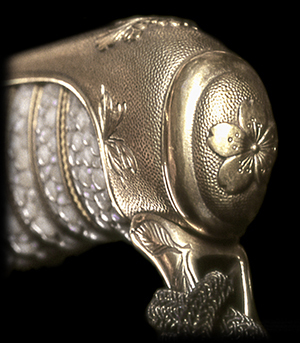 A scabbard has cowhide lacquered exfoliation 100 years after from the naval battle in the Sea of Japan. This is the first, historically precious mounting to revive with a color picture. The precious photograph of old days considered to have been photographed after the naval battle of the Sea of Japan. 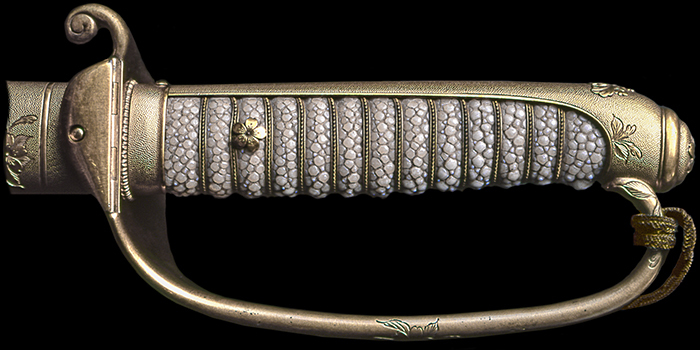 It guesses from a blade length and it turns out that it is a magnificent Tachi with large width of a blade. 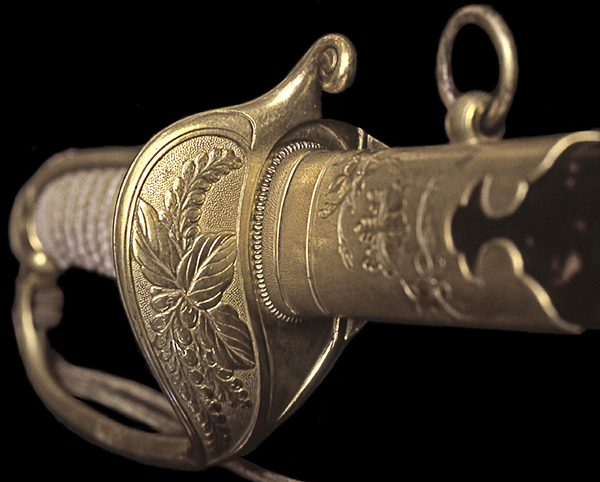 The Japanese sword of a battle use was such magnificent structure with a pile thick, and large blade width. 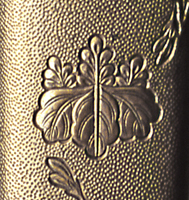 The engraving pattern of paulownia of 5-7 on a guard. The paulownia is the Imperial Household's crest as well as a chrysanthemum. Line engraving of "Paulownia of 5-7. The knot of a tassel expresses the rising sun.